Hey friends! Sorry I’ve been so “absent” lately. Well, I guess I haven’t actually been absent because I’ve posted, but they aren’t posts about what we’re up to. Honestly, we’re not up to much. I’m thankful that this week has been “regular” and we haven’t had any crazy plans. We’ve been at home. It’s been awesome. We also have been laughing so much lately and I love that. 1. Still reminiscing about the minion… If you missed that post please CLICK HERE and check it out. My mom seriously rocked this one. 2. 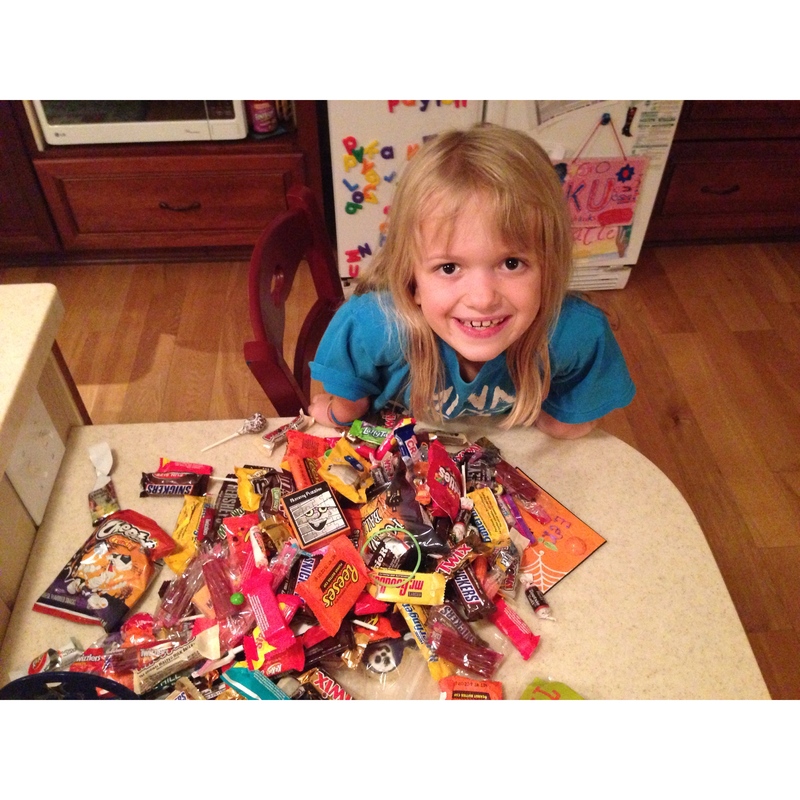 While I think back about the minion, I can’t help but remember how happy this little fourth grader was when she looked at all her candy at the end of the night… Oh to be 9 again – and in love with Halloween. 3. I’m on level 350 of Candy Crush… Should I feel embarrassed or really accomplished? I vote for the latter. 4. Alfred has had some poopcidents these last couple days. We made the mistake of allowing him to chew up an entire bone in one sitting (it was a big bone) and we are paying for it. I’m sick of cleaning up poo in liquid form and ready to stop cleaning the poor guys bum in the sink. 5. I’ve been doing handstands. A lot of handstands. It’s a serious workout. Last nightI spent a little too much time upside down and had a serious light-headed moment. I’m grateful for apples and peanut butter cut up by my hubby to make me feel better. 6. Mike and I have been watching a new TV series called Arrow. It’s pretty good – we’re enjoying it. So that’s where we are! I’m so glad the weekend is near. « Make Your Own Minion	» The Jaderstons are Moving!